Most melanomas are discovered on the skin, but in rare cases they have no outward sign and literally show up where the sun doesn't shine. That's what happened in 26-year-old Grace Pophal's case. The first Monday in May is designated as Melanoma Monday by the American Academy of Dermatology. A day to raise awareness to the deadliest of skin cancers. Most melanomas are discovered on the skin, but in rare cases they have no outward sign and literally show up where the sun doesn’t shine. That’s what happened in 26-year-old Grace Pophal’s case. Doctors removed a mole from her hairline when she was 12, it may have been pre-cancerous, she’s not sure. But melanoma was the last thing on her mind when her symptoms started, by the time, she was 23. “I started not being able to see out of my right eye and I was having this crazy back pain all the time,” Grace says. An x-ray revealed a mass on her lung. But it wasn’t lung cancer, it was stage 4 metastatic melanoma. 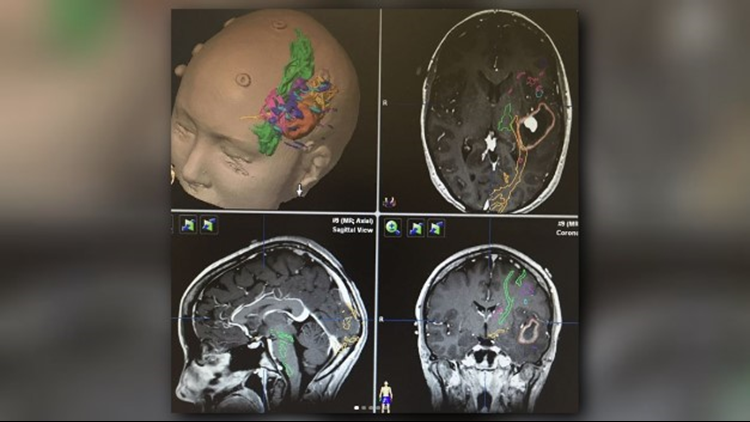 She ultimately had tumors on eight organs and five more in her brain. “At the time when she was diagnosed it was like a four or five percent survival rate,” says Grace’s mom, Patty PoPhal. Her doctors still don’t know where the melanoma started, but sun exposure is the likely trigger. “I was a lifeguard in high school, I've been a swimmer since I was three years old swimming outside in the summer but I was never like a tanner with UV lights all the time but I wasn't on top of putting enough sun screen on though,” Grace says. She underwent two brain surgeries and now receives targeted medication in her chemotherapy every two weeks. She’ll need those treatments at least until the end of the year. It’s been three years since her diagnosis and she’s still fighting. She now has two remaining tumors she’s hoping the medication is able to shrink, but it’s a long road ahead. The woman who was a competitive swimmer at Ohio State University takes care of herself with yoga, a vegetarian diet and a positive focus. She hopes her story sends a strong message. “People still stay out in the sun and don't put sunscreen on and I'm like you guys didn't you learn enough from me I'm like come on put some sunscreen on and cover up,” Grace says. Grace is also focusing on fundraising for Melanoma research and helped bring the Miles for Melanoma 5K Walk and Run to Edgewater Park for this coming August. She and her mom promise to be handing out sunscreen.